I was slow to discover the charms of kaya. But now that I have there's no turning back. Who can blame me for initially turning my nose up at this 'jam' of coconut milk, eggs, and white sugar? My first taste of the concoction was from a can plucked off a dusty shelf in an Asian market in California. Inside, I found not a trace of coconut flavor - just sweet, thick, exceptionally sticky blech. It took fourteen years for me to learn that 'real' kaya has as much in common with the canned stuff as a Maggi chicken cube dissolved in water does with long-simmered homemade chicken broth. Kaya means 'wealthy' or 'rich' in Malaysian, and those words accurately sum up its attractions. 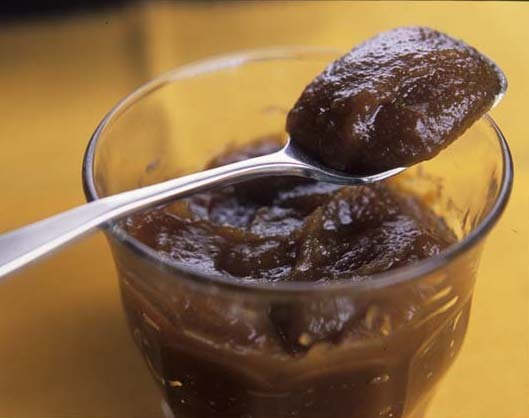 Lushly coconuty, extravagantly eggy, and deeply caramely, kaya tastes something like a moist macaroon, a well-executed flan, and mom's butterscotch pudding all rolled into one. Some prefer their dough sliced from a loaf, while for others only a bun will do. I can't play favorites. 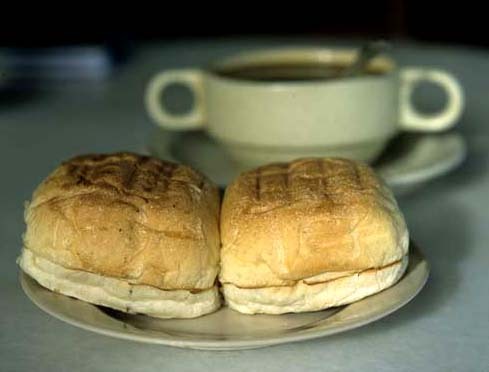 Less than a week after swooning over butter and kaya-slathered sweet, puffy, soft-as-a-baby's-bottom xiao mianbao (little buns) in Kuala Terengganu (above) I was swearing eternal allegiance to the larger, wheatier, and altogether more substantial puffs on offer at Kuantan's Kememan coffee shop (below). Then with one bite of Village Park's kaya toast all thoughts of buns were wiped from my mind. This restaurant's Singaporean owner decrees that plain white loaf be sliced super thin, evenly toasted on both sides, and then sliced again. The "raw" sides are stuck back together with the barest slick of butter and kaya mortar. The result is an ethereally light but saporific kaya toast that, after the initial crunch, practically melts in the mouth. Beyond the loaf-versus-bun debate, there are a three requirements for a memorable kaya toast. Bread or bun should be white - not sourdough, not whole-grain nuts 'n stuff, not chewy artisanal provincial French doorstop bread. I'm not a white bread fan in general, but it's really the best kaya base. If the dough product is to be toasted (kaya is also eaten with steamed bread) it should be over charcoal (or at least not in a toaster - use your oven's broiler instead; all the better if the oven is powered by gas). And the medium of lubrication should be butter, not margarine (Kememan comes out a loser on this point). 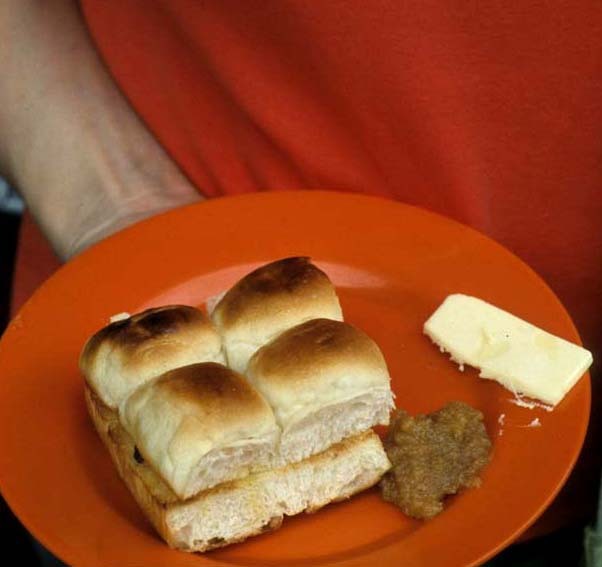 Kaya and butter may be served on the side, but if an order arrives pre-spread the layers should be thin, ant there should be re-enforcements on the plate. Readers who have been living a kaya-less existence (if you've tried it but don't like it - huh? - this won't apply to you) and can't purchase the good stuff (ie. not canned, not jarred, not mass-produced) should consider making their own. I can think of a few uses, other than as a bread spread, for this delicacy: as filling for a vanilla or chocolate sponge roll, as a topping for ice cream (a bit beyond the pale, perhaps), used instead of frosting on a rich chocolate cake (or in addition to frosting, between cake layers). This recipe looks quite good (it's from the author's grandmother). It's not clear as to the amount of coconut milk to be used, so I'll clarify. Based on a survey of five different recipes, 600 ml of coconut milk, 10 eggs (the bigger the yolk the better), and 400-500 grams of sugar (depending on how sweet you want your kaya) seem to be the standard quantities. canned coconut milk will, unfortunately, produce an inferior product. But making your own isn't that hard (or time consuming, if you use dessicated coconut). From freshly grated coconut: place 2 cups coconut into a blender and add 1 1/2 cups very hot water. Blend for a few seconds. Line a sieve with cheesecloth and place over a bowl. Pour the coconut mixture into the sieve, gather up the corners of the cloth, and squeeze the liquid out of the coconut. From unsweetened, dessicated coconut milk: bring 2 1/2 cups water and 2 cups coconut to a simmer in a pan. Pour into a blender and proceed as for fresh coconut. Both methods should produce about 350 ml/12 ounces of thick coconut milk. if you use a double boiler constant stirring throughout the entire process is unnecessary, unless you desire an absolutely smooth kaya (for those, like me, who like a bit of texture, small lumps are not a problem). Some recipes require the kaya to be cooked over a double boiler for as long as 4 or 5 hours. Have a look at the photo above, see how your product compares in terms of consistency, and continue to cook if necessary. Refer to my Malaysian coffee post for addresses of the kaya toast spots mentioned above. Thank you for postingabout kaya - one of my fave jams! Hi! This appears to be just like our own coconut jam in the Phils. Though this has more texture I admit. Do know that after finding out about your site from Global Voices Online, I read your blog religiously. I never thought Malaysian food was that good. Definitely will try to visit Kuala Lumpur in the very near future. I was supposed to do it 2 years ago but got seriously sick 2 days to my flight and missed the chance. Go try the kaya sold at the Nyonya Kuih stall in Hock Seng 2 coffee shop in SS2. It's really rich & thick...slurp. kaya...mmm. 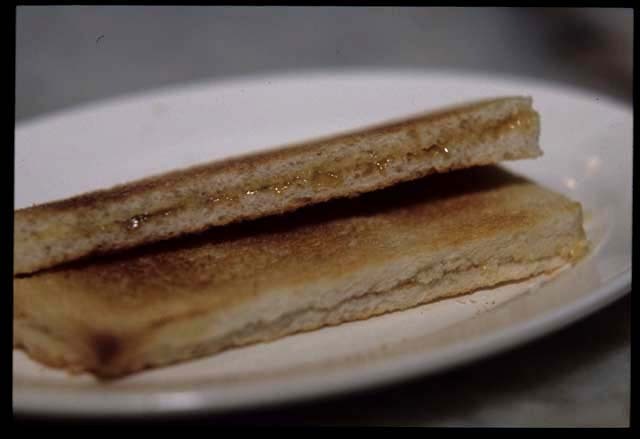 it has to be plain white loaf bread (better kaya to bread ratio), sliced as in your post, just barely toasted initially, then once assembled with butter & kaya, toasted again briefly on both sides so the kaya is warm when you bite into it. MM - I'm really not a jam and toast type, but I make an exception for kaya! Hazel - I think a lot of foreigners haven't a clue as to what Malaysian food *is*, let alone that it's great (I know I didn't, not before my first trip here). IMO the Malaysian Tourism Board is missing a great oppty to promote Malaysia as a foodie's dream destination. Welcome you to enjoy all that KL has to offer! Drop me a line if you want to meet for a bite or a meal. Serena, thanks for the tip re toasting *after* kaya is applied. I think this is what Village Park does. mmmmm indeed! 1 cup santan to 1 cup eggs to 1 cup sugar. I made it once using the double-boiler constant stirring method. These past few days I've been thinking of making it again, but this time I will try a less strenous and sweaty method. Oops...sorry, it's me edward. accidentally typed in your name in the name field. I'm salivating! We had kaya toast in Sing but can't get the really good stuff here in OZ - sob, sob. maybe I will have to try making it. Thanks Robyn! I'll definitely get in touch with you when I'm there. Hi there. I'm the author of that kaya recipe from Makantime. Glad it made it here. My grandma passed away in 2003. Bless her soul. I'm still making this kaya. However, intrepid members of kitchencapers.net have made various versions using microwave ovens, bread machines and slow cookers. Just register and join the forum. Search for "kaya". Gina the site mod has her own recipe. tthksy has her own family's passed down recipe. BTW, the green nonya version is pretty good as cake filling. I can almost smell the kaya while going through the recipe. Thanks. Well, my kampong have a different way in having this breakfast. They call it roti kahwin. As soon as the toasted bread is spreaded with kaya. Slice a piece of chilled salted butter and sandwiched it in between. Enjoy. Oh, those thin, incredible slices of bread toasted hot and divided by cold kaya and a slab of butter - how could bagels or doughnuts ever compare? I wish I were home in SG again. I would like to know whether I can use Gula Melaka instead of regular sugar for the Kaya, Thanks. Aside from white bread, I also like to eat my waffle with kaya. It's so good. Ask the waffle seller to slap a layer of butter on one side, then kaya the other side. Fold it together and take your first bite. Yum... my saliva is dripping now..
just tried the kaya spread with the recipe above and it just tastes really good. i tried the double boiler method. it turned out brownish color maybe because i used the light brown sugar. i'm just wondering how come in Yun Kaya the Kaya is light yellow i wonder if they just use pure egg yolks? The kaya being sold at Liza's place at the Taman Tun Dr Ismail is the best I've tasted. Based on the Penang Nyonya recipe, it's thick and satisfying. There's only one type, no green or brown choice.